Autoload is a state of the art loading computer. Used around the world, Autoload is installed on virtually every type of vessel - ro-ro, container, bulk, semi-submersible, coastguard, naval, cruise, fishing, survey, tanker, supply vessel... and more! At present, Autoload has been installed onboard more than 700 vessels. Including secured orders the user list will rise to more than 1000 vessels before the end of 2010. With Autoload we are market leaders on the most complicated vessel types, from the stability standpoint, such as semi-submersible heavy lift vessels (lifting floating rigs out of the water) and semi-submersible offshore rigs. The biggest ever built “Thunder Horse”, has more than 300 tanks online, draft, mooring (including horizontal forces) and online wind sensors. Thunder Horse, was even delivered to the operational site with the vessel (Blue Marlin) using Autoload as its onboard stability analyzer. Also from our development project for the Wallenius Willhelmsen roro fleet (the AutoLoad cargo planning system is now managing cargo on over 100 vessels, 24/7, in all zones of the world). This unique project has given us unlimited cargo planning features to pick from our shelves, for use as features for offshore vessels. 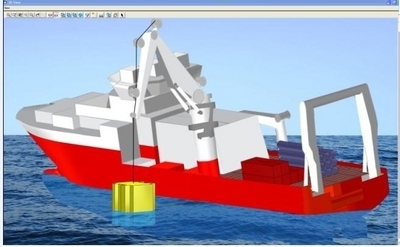 The Autoload loading computer uses a complete 3D model of the vessel, identical to the model used for creating the approved stability booklet. Designed to meet IMO loading computer requirements, Autoload enables vessel operators to perform accurate stability and strength calculations for any vessel loading condition. All calculations are performed from first principles, ensuring that results are true at any displacement and any angle of heel or trim. Autoload can be installed on any computer using the Windows platform . For optimum performance, we recommend that the computer specification should be at least: Pentium 4, 3GHz with 512 MB go RAM, 100MB free disk space, 128MB video card with open GL support , DVD/CD reader, USB port, serial port, Ethernet card.